Remember too that early on, players do not need the most expensive gear; it’s more important the equipment fit properly. 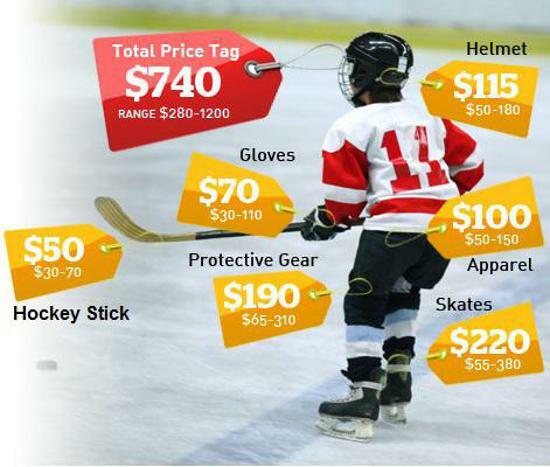 $740 is an average cost to purchase all new gear for a youth player based on a study conducted in 2014. However, RAHA offers an equipment rental program for only $50 per season available to both Skaters & Goalies!! Click Here to contact a board member for more information regarding this program. If you’re child just wants to play recreational hockey (at an out door hockey arena, or during stick and puck sessions at the arena) less equipment is required. For outdoor hockey all you really need is skates, a helmet and a stick (although new players should wear elbow pads and shin pads for more protection). ©2019 Redwood Area Hockey Association / SportsEngine. All Rights Reserved.